On Christmas eve, Santa was excited but when he went to his reindeer there were none left except for Rudolf. 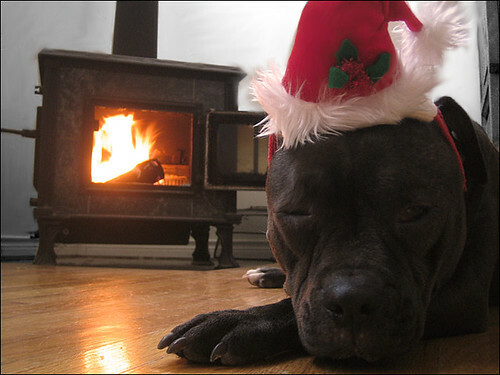 A lot of pitbulls came out of nowhere and ate Rudolf. Santa said, “That’s great! Now What? Oh I will use the Pitbulls instead of reindeer.” Santa named them but only one didn’t agree with his name, George, so he changed it to Bob. They took off and they made their first stop. They were tired. As Santa filled the stockings he noticed the very ugly decorations, especially the Santa getting shot in the face with an arrow ornament. So all he left was coal instead of Presents. When he was done he went back to his sleigh but the pittbulls were gone. He took the present marked for Tommy from his sleigh and was thankful for the sudden blizzard. It was a snowboard. He used it to snowboard to his next stop and went into the house. He opened the door and there was mistletoe. Santa thought to himself that it was finally acceptable to have a “moment”. Then he noticed that he had forgotten the presents in his sleigh. As he was running out of the house someone woke up. Santa tried to hide by climbing up the chimney like an assassin. The person that woke up saw Santa but didn’t know who he was. It was only then that he realized that the elves had shaved his beard off while he was sleeping as a joke on the old man. So there was Santa covered in dirt from the chimney with no present and no beard with pittbull bites all over him. The people in the house called the cops. Santa went to jail and never came back for Christmas ever again. Have a story you would like to respond with for my young friend? I’ll deliver it to him for you.